Cassida Pro – Serving banking, financial institutions and larger retailers that require heavy duty, accurate and advanced solutions to meet their high volume cash processing needs. Cassida Pro creates innovative and leading-edge technology to serve the banking and financial industry as well as retailers that require heavy-duty and precise solutions to meet their high-volume cash processing needs. Durability and accuracy are key requirements in cash handling. For over a decade, we have used our superb engineering, innovative design, intuitive user interface and precision in order to both service – and become a trusted partner to – global banks, financial institutions and larger retailers. 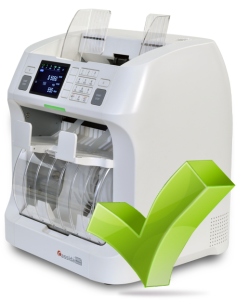 The Cassida Pro Series is built on the concept of delivering real value, by giving those who use cash processing machines a strong voice in product development. And we continue to communicate with industry representatives and those who supply the cash handling sectors with equipment. Why should tellers and cashiers do multiple processes? At Cassida Pro, we live for streamlining, and develop ways for our devices to take on the bulk of the workload. And we’re passionate about giving you value. You’ll find our devices offer multiple counting functions that legacy machines can’t match.We engineer durability and efficiencies into the Cassida Pro product line, consciously working to meet the demand for a streamlined solution that performs better. We believe in creating products that work hard for you and your team, so we’ve introduced the Cassida Pro Series Zeus, a 2-Pocket Currency Discriminator. Take a look at what the Cassida Pro Series Zeus can do for you. Cassida Pro is a division of Cassida North America, America’s number one brand in business grade cash processing. For over a decade we’ve enabled small businesses to count, detect and process cash. Now we’ve built our innovative Pro Series brand to specifically serve banking, financial institutions and larger retailers that require heavy duty, accurate and advanced solutions to meet their high volume cash processing needs. All Cassida Pro Series products are developed to solve real-world needs. We work directly with tellers, cashiers and cash room employees, using their feedback and insight to build better, more intuitive products that streamline processes, save time and improve efficiencies in cash handling. Our lineup of products continues to evolve and products are continually being developed by our US-based product development team. Check back often to see what new ideas and innovations we’re bringing to market.